If you have lived outside of Nigeria long enough, you must have gotten questions like the ones below. Not only are they ridiculous, but some of them are downright offensive. Anyway, back in college, I used to gist with some of the African students about these types of "encounters" and some of their responses are reproduced below. Note: I paraphrased some of the responses, and added my own jara in some of them. See if you can figure out which is which. 1. Question: How did you get here (to America)? Answer: I swung from tree to tree across oceans and seas, and Voila! Here I am! 2. Question: Do you live in mud houses? Answer: But of course we do. In fact *whips out a leather bag with a hut engraved on it* This was my hut in Ghana. It was on a tree, right next to your (American) father's hut. Answer: Oh! I got them while fighting lions and tigers. 4. Question: Do you know [insert name of "random-African-you-just-met-today" here e.g. Kunle]? He's a tall, black, skinny, African guy. Alternate Answer: Oh, do you know Bob? He's a tall, skinny white guy, and he goes to this school. 5. Question: Do Africans wear clothes? Preferred Answer: See Answer to # 4. The sad part about all this is not just that someone would ask such ignorant questions, but that that person would actually believe these answers. So, what ridiculous questions have you been asked and what were your answers? Kindly share. ROFLMAO... Yes! 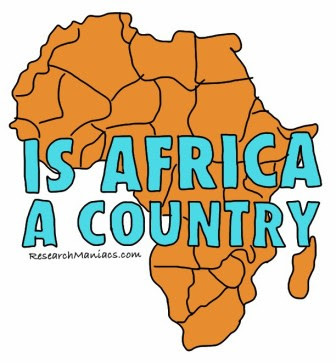 Africa is a country you maggot lmao. Oh and then there's the question of 'how come you can speak English?' and the did you ride on Elephants to go to school? ---> no that was reserved for the rich princes, we had to swing on banana trees like monkeys to get there everymorning. Lmaoooooooooo, this is so funny! Especially 4! Kaymi / Kemi: Lol! Glad you got a laugh out of it. Nollywood Reinvented: Where do I start? First, thank you for reminding me of the Wild Thornberries. E don tay when I watch dem last. Second, Oh my goodness! That stupid English question is just a classic nightmare. I forgot to add that. It should be up there with 'So do you like speak Nigerian?' ... I have no words for you Jeremy. Third, Of course the elephants were reserved for princes. I mean, didn't they watch Coming to America? Oh wait, they did! I blame that movie for a good chunk of this. Dayo: It is sad and proves that even highly educated people can still be ignorant. Very ignorant. Lade Tawak: Lol! Oh my goodness! Your friend's response is hilarious. I have never ever ever heard anything like that before. I wish I'd included it in this list. Please ask her: Was there also a voice in the cloud? Hehe. And someone will actually believe such a story. Thanks for sharing o jare! Roaming Nomad: Eeeek! How did I leave this one out? I myself have been asked that annoying question. I would like someone to teach me how to speak Nigerian. That would be interesting. Lol at your reaction. I mean, what would the person do if you said can you speak American or North American. Simply ridiculous!